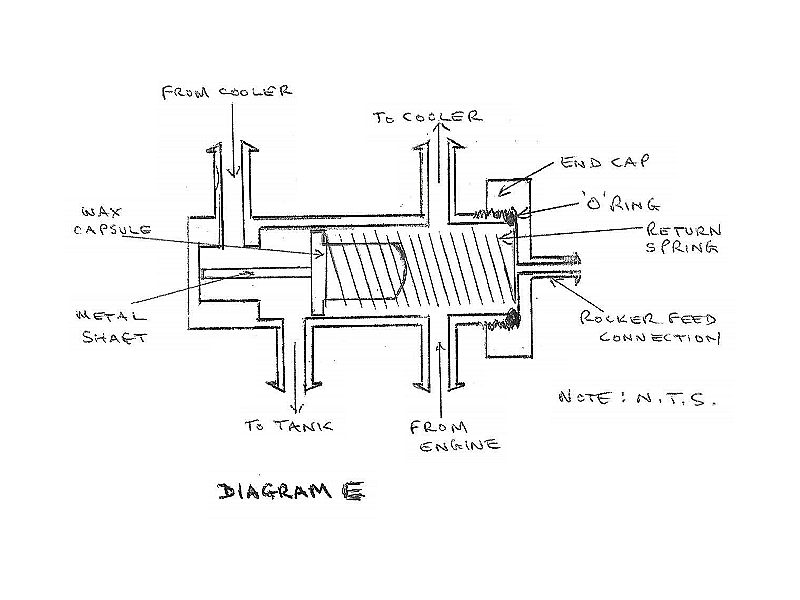 Diagram D shows the unit in the "cold" condition. The oil flows into the thermostat where it surrounds the wax capsule. The top edge of the wax capsule is pressed against the step in the thermostat body by the return spring. This is not a 100% seal - but not far off it. This means that the vast majority of the oil returns straight back to the oil tank as the cooler return is almost 100% isolated from the connection for return to the oil tank by the wax capsule being pressed against the thermostat body step. As the oil temperature increases to the control temperature of the wax capsule the metal shaft of the wax capsule is forced out of the wax capsule. As the outer end of the wax capsule metal shaft butts against the thermostat body end wall this end cannot move so the wax capsule moves within the body against the force exerted by the return spring. 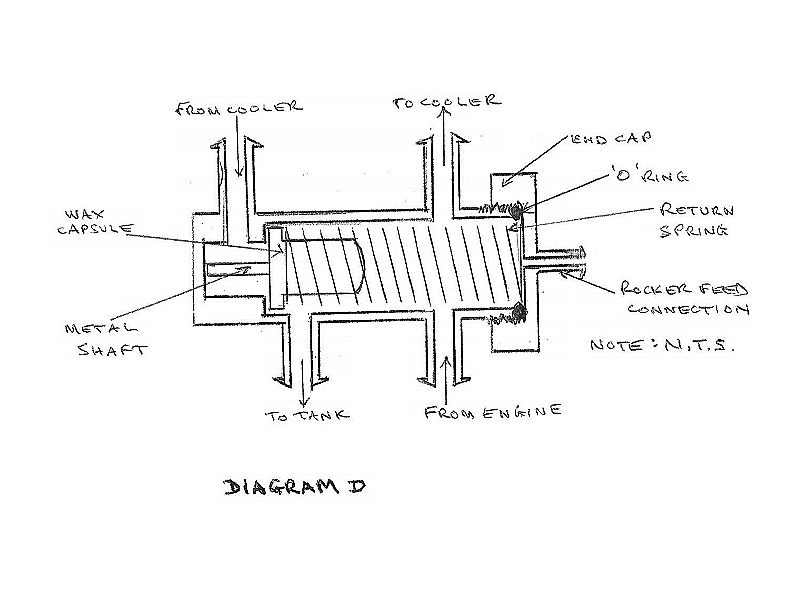 This continues until the situation shown in Diagram E.
As the wax capsule moves it progressively causes the oil flow to go through the cooler rather than taking the by-pass route. With the position as shown in Diagram E virtually 100% of the flow goes through the cooler. The wax capsule flange is a good sliding fit in the thermostat body so very little oil can by-pass the cooler. The rocker oil feed is fed from the oil flowing from the engine respective of the valve operating position. The oil fed to the rockets is therefore "hot" oil from the engine, not cooled oil from the cooler when it is in circuit.